Our extended fishing trips are truly the best way to squeeze the most out of your Montana Fishing Vacation. There are many options and variables to most of these trips. We like to work closely with you in planning your vacation itinerary to ensure we know exactly what you are looking for. Some of the factors we consider are: the make-up of your party – are you a family with children, corporate group, friends and fishing buddies, beginners or experienced, hard-core or laid-back, do you prefer floating, wading, or a combination of the two? Would you like to take a day off from fishing to participate in other activities? Some of these activities are: horseback riding, a visit to the Garnet Ghost Town, gopher shooting, wildlife viewing, hiking and exploring the Upper Blackfoot Valley, Continental Divide, the Lewis and Clark Trail and Pass, or the Rocky Mountain East Front. We can begin fishing the Blackfoot by raft or boat about 18 miles downriver from Lincoln, for nearly 100 river miles to Bonner, near the confluence with the Clark Fork River. The length of each days float can range from 3 to 12 miles. Float into your “full-service” riverside camp each evening greeted by our camp chef offering tasty appetizers and cocktails. Your tent and cots are set up- just make yourself at home. After a hearty home-cooked meal you might want to get in a little evening fishing, go for a stroll, or just lounge around the campfire telling fishing stories over a drink. In the morning, get in a little fishing before breakfast, or sleep in until the enticing aroma of fresh brewed coffee, bacon, and campfire smoke lure you from your cot. After breakfast, we pack up, jump in the boats and head down river for another fun-filled day of float-fishing. In the Upper Blackfoot Valley , near Lincoln, We have access to over a mile of pristine private ranch land for fishing and camping, and numerous access points along nearly 20 miles of the Blackfoot, providing the best mid to late summer wade-fishing you can imagine. Fishing pressure here is light to non-existent, resulting in very cooperative cutthroat, rainbows, and browns. Just over the “Divide”, about 25 miles east of Lincoln, we have access to several miles of private land along the three forks of the Dearborn River. The North Fork, or “mainstem” is the largest branch, and is floatable just before and just after peak spring run-off until it gets too low to float, usually by the second week of July. Salmonfly and Stonefly hatches can result in some fantastic fishing. We have private access to 3 miles of river upstream of the popular floatable stretch, that offer great wade fishing, and beautiful riverside camp locations. We have two miles of private access to the Middle Fork of the Dearborn, which is a bit smaller, but holds lot’s of fish. This short branch is a phenomenal fishery. The fast riffles, deep pools and undercut banks are a fishes’, and a fisherman’s dream. Huge rainbows and Brown Trout are eager to smash a hopper floating thru their pool. The South Fork of the Dearborn is the smallest branch of the Dearborn, and where we have our semi-permanent base camp for our Big Game Hunts. This small stream is brush choked in places, and dotted with beaver dams along the two mile private stretch of this stream. There are surprisingly large rainbows, browns and brook trout in this small stream that will challenge your stalking and casting skills. These Dearborn locations are within a few short miles of each other, so all may be fished from the same camp location. 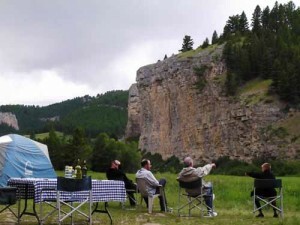 Mix up your trip by alternating days wade fishing these areas with days float fishing the “Blue-Ribbon” designated Missouri River, which is less than 20 miles from any of these camp locations, or the Blackfoot, a short hours drive west. All these options, from the Blackfoot to the three forks of the Dearborn, to the Missouri, can be mixed and matched exactly how you want for as many days as you want. In June, and most of July is the time to float the Smith River. We try to do a trip or two here each year. This is a 60 mile, 5 day trip through a mini “Grand Canyon”. The fishing is usually fantastic, and the scenery breath-taking. The bug hatches are prolific and numerous, triggering frantic fish feeding frenzies. It’s hard to keep your eyes on your fly due to the distracting scenery as you float between sheer towering cliffs impregnated in places with crystals, in a couple places ornamented with Indian paintings, and dotted with eagle and osprey nests. It’s common to see deer, elk, black bears, and all kinds of waterfowl and other birds. This trip begins at “Camp Baker” 26 miles or so from White Sulfur Springs, and ends at “Eden Bridge” 25 miles or so from Ulm, on I-15 just south of Great Falls. Smith Trips are run in cooperation with, and under Lewis and Clark National Forest Service Special Permit Holder and outfitter Mike Geary, owner of Lewis and Clark Expeditions. This gin-clear river runs thru the heart of the Bob Marshall Wilderness for nearly it’s full length, south to north. Horses and mules transport us, our boats and gear 20 to 26 miles (depending upon which trail we take in), then float the 50 miles out over the course of 5 days. The South Fork is home to an incredible number of Westslope Cutthroat, and the huge Bull Trout (Dolly Varden). The South Fork is one of the very few places in the lower 48 where we may legally fish for these carnivorous monsters. When you go on a South Fork Trip, you will fly into either Missoula, Kalispell, or Great Falls, depending upon which trailhead we begin the trip from. Each trip may take a different route in, but all will end the same place, which is nearest to Kalispell. We conduct very limited, and highly coveted South Fork trips in cooperation with Outfitter Joe Sowerby, and Permit Holder and professional packer, Joe Muretta. There is lot’s more you need to know about a South Fork Trip, so please call today for more information! If you fly to Montana, we will provide transportation to and from the airport or hotel in the city closest to your trip location. For South Fork trips, it’s Kalispell. For our other trips, Missoula, Helena, or Great Falls, whichever is best logistically. With all these fantastic options to choose from for your Montana Fishing Trip, I’m sure we can put a package together you will be entirely pleased with. So call today, and let’s begin planning your Montana Fishing vacation!